I received the most fabulous Christmas present last year. Something I’ve been researching and wanting for awhile now. A milk frother. After becoming increasingly jealous of my friends posting photos of delicious, frothy, and cozy homemade lattes of all sorts, I got to researching. It seemed like the reviews for milk frothers were so hit and miss, I eventually got distracted and stopped checking. Until my sister and her (then) boyfriend made me an extra special hot chocolate. It was made with frothed milk! It was so good, and I’ll be sharing a recipe to update my Healthy Hot Chocolate with the frothed milk twist. But today, I want to share something a little different. 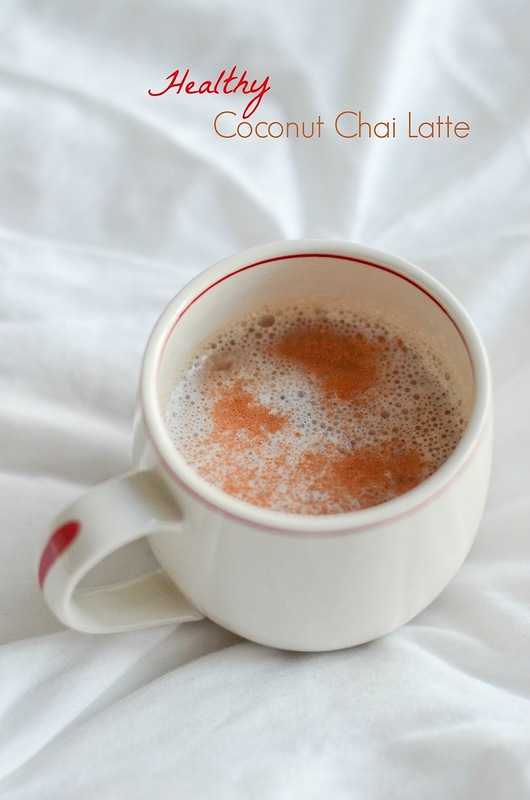 My Healthy Coconut Chai Latte recipe. Please note: This post contains affiliate links. If you make a purchase using one of these links, I’ll make a small commission at no charge to you. I’ve personally used and love the products recommended in this post. But if you have any questions, don’t hesitate to reach out. 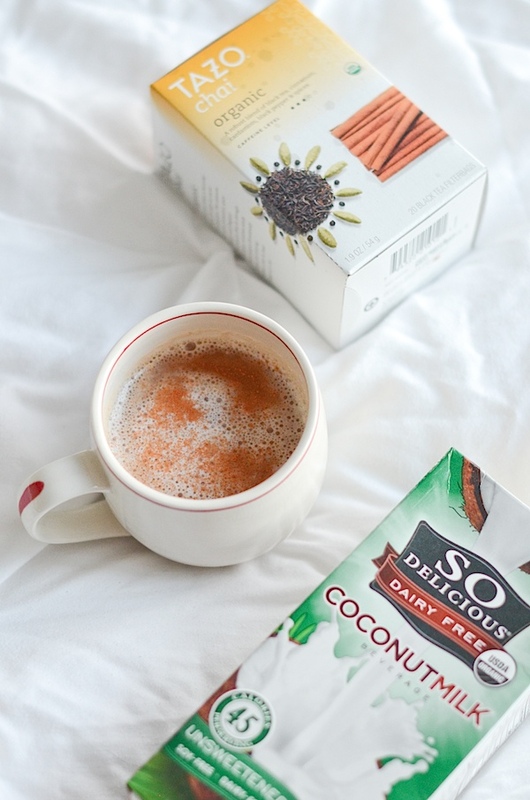 What makes this a Healthy Coconut Chai Latte Recipe? Tea bag vs tea concentrate: The main ingredient used at most coffee shops (that I’ve been to at least) to make chai tea lattes is tea concentrate. From a clean eats perspective, the concentrate is more processed than brewing your own tea. Controlling your sugar: The tea concentrate is usually pretty darn sweet too. By making your chai latte from scratch, you get to control how much sugar you consume. And on top of that, you get to pick what you use! Opt for a more natural version like honey. Or try a slightly healthier sugar, like raw or turbinado sugar, which is typically less processed and unbleached. 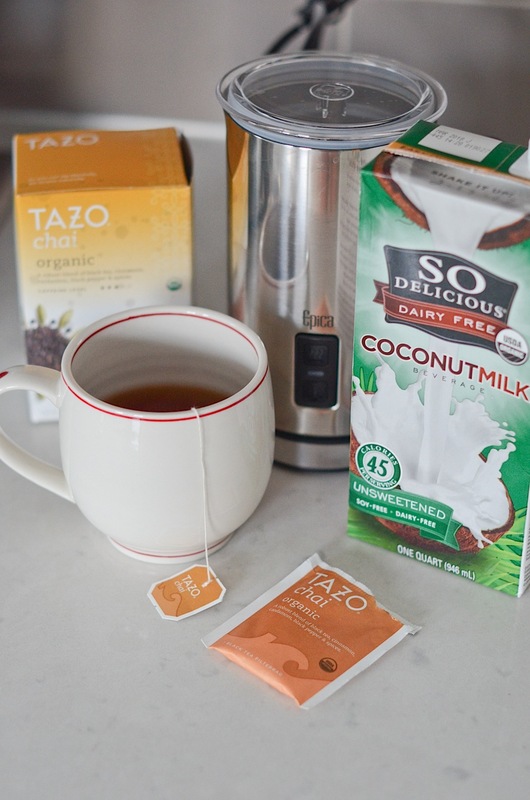 I opted for Tazo Chai Tea Bags , since I’ve often seen the Tazo Chai Tea Concentrate used for chai tea lattes at coffee shops I frequent. And I love how Tazo has an organic option! I’ve been wanting a milk frother for awhile so I can get that latte-style milk at home. For Christmas, I requested the milk frother my sister and (now) husband have. They’ve been really happy with it, and I had tasted the results of this frother myself. And they are good! My frother search was over. My sister and her husband use the Epica Automatic Electric Milk Frother and Heater Carafe . I’m planning to do a full review of this frother, but I want to test out a couple different milks first since you guys may be using many different types. Plus, I want to make sure I’ve used the frother long enough to give you a good opinion. I do have to tell you that the coconut milk does not froth very well. At least not the one I used (So Delicious coconut milk). It doesn’t get nearly as voluminous as other milks I’ve tried. You can kind of tell this from the “after” photo above. Normally, once the milk is frothed, it almost reaches the top of the frother. You can kind of see how low the level is in the photo. But, hey, you still get some bubbles, which is fun. Add a dash of ground cinnamon or cardamom on top for extra spice. 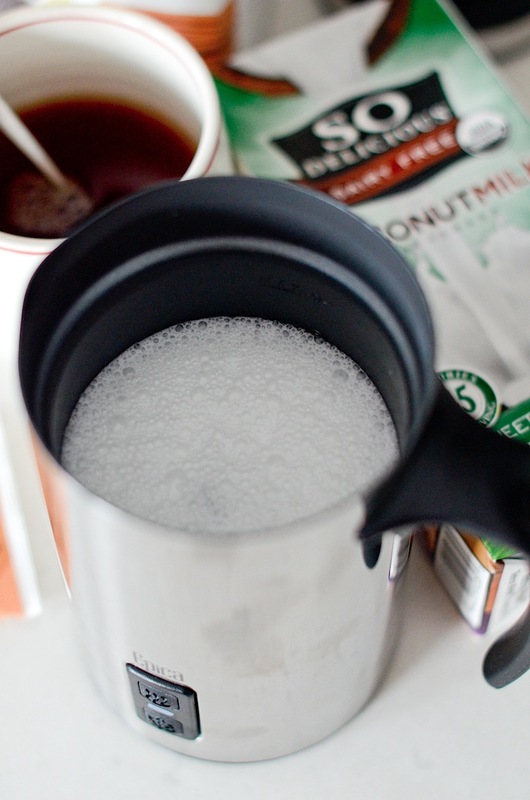 Bring the coffeeshop to your home with this easy Healthy Coconut Chai Latte Recipe. Place tea bag in a large mug and brew according to package directions with 1 cup of water. When tea is done brewing, remove tea bag and stir in sugar (or sweetener of choice). Add 1/3 cup of coconut milk to the frother. I was able to pour in a little more to come up to the max fill line. Froth milk according to frother directions. For the Epica, be sure to use the frother attachment and simply add the lid and then press the warm froth button. When the milk is done frothing, gently stir the frothed milk into the mug. Add a dash of cinnamon or cardamom on top. The products I used to make this tea are referenced in the blog post. For the mug, I used a 15 ounce mug and had plenty of space. 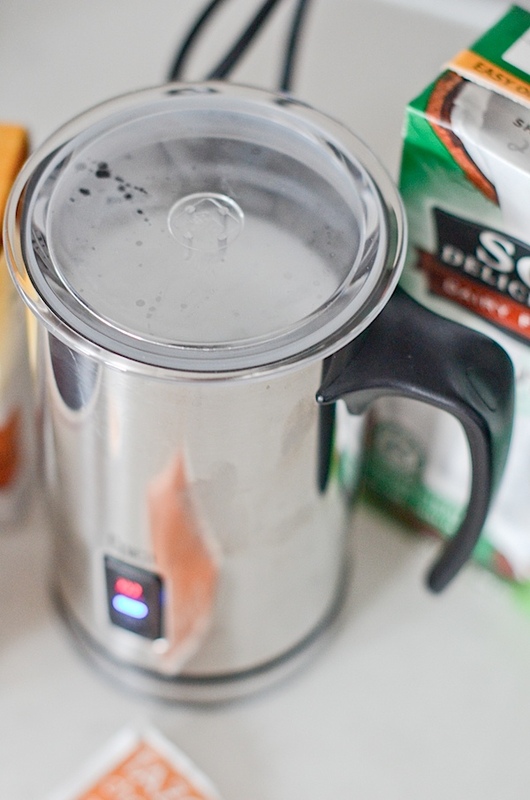 With the right equipment, homemade lattes are super simple to make yourself. Just think of all the possibilities! I know I am, and I’ll be sharing more frothed-milk recipes in future blog posts for sure. 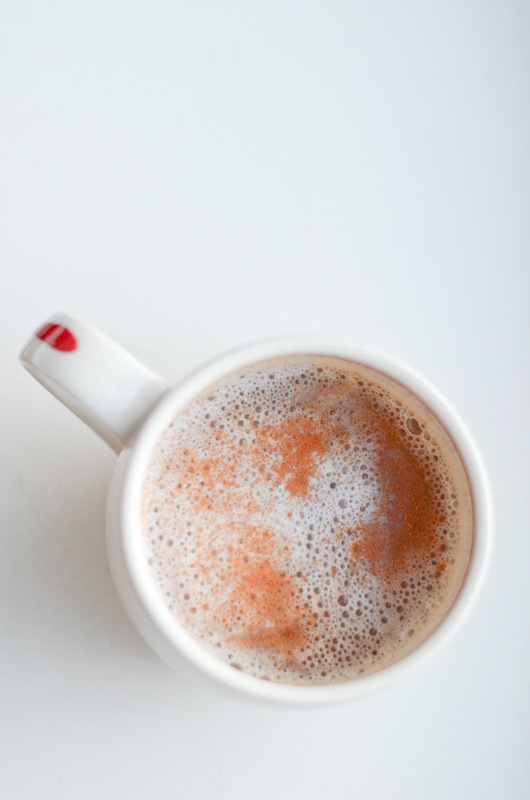 Hope you enjoy this Healthy Coconut Chai Latte Recipe. Thanks for stopping by!